e in electro-infused indie pop that brings to mind an array of bands spanning everything from Death Cab for Cutie to Duran Duran. Their sound has won them a devoted following, which led to a Last Band Standing slot at last year's Lollapalooza. The band - comprised of Jason Caldeira, Brian Fifield and Dave Moran - released its second LP, "Sizing Up the Distance," late last month. The album is a satisfying listen, but one that you have to dive into a few times before all of its charms and subtleties fully reveal themselves. Beginning with "Emergency," which quietly snakes along for a while before transforming into a full-fledged springy pop tune, the CD moves into more challenging fare such as the six-minute-long "Getting Out of Town" and the shifty sounds of "Iran." The real standouts, though, are a bit more straightforward. They include the melodic, slightly Shins-like "Headlights," the unapologetically dancey "Still Silhouettes" and "White Lily No Soul," a nod to the dancier side of 80s new wave that sounds like it was written for Simon Le Bon. Even with these more outright quailities, the music maintains a restrained, thoughtful feel that stays consistent with the overall mood of the record. 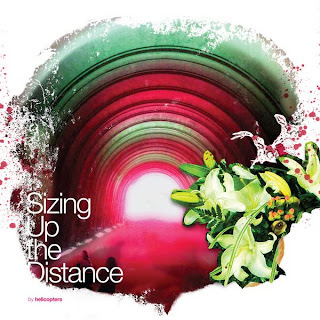 "Sizing Up the Distance" is a perfect backdrop for more mellow, introspective moments, when you really want to get lost in the sounds and textures of songs, but at the same time it's not without playfulness and pop sensibilities that will keep you coming back for repeated listens.